Disclaimer: this post is brought to you by the honest kitchen. All opinions are my own, and I only share products I think you and your dogs will love. While Trooper and I may look hot in this picture, the truth is the warm summer weather will be leaving us soon. With it we’ll have to say goodbye to our lush veggie gardens and the summertime harvests that have been so abundant this year. Eating healthy, fresh ingredients isn’t just important for the humans, it’s important for us dogs too. While mom can’t grow everything Trooper and I need to maintain a healthy diet, I want to share with you the newest addition to my healthy diet that’s available all year round! 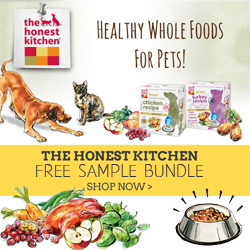 My friends at the Honest Kitchen are makers of all natural, human grade dehydrated dog and cat food. Their foods are produced in the USA from non-GMO produce and hormone-free meats. One of the newest addition to their healthy food line is called BRAVE. This limited ingredient diet contains only six ingredients: MSC certified pollock, organic coconut, chickpea, celery, pumpkin, spinach, plus vitamins and minerals – which is perfect for dogs that may have allergies, or prefer a more simplified food. Brave had a great fishy smell, which I picked up even before mom opened the shipping box it came in! And all you have to do is add water to this food to get it to puff up to a full (and filling) meal. I look forward to scarfing it down at mealtime. While neither Trooper nor I have any food related allergies, we can certainly appreciate a simplified diet with only the healthiest of ingredients. Just like all the yummy home grown veggies in mom’s garden! There’s lots I want to share with you about how I’ve added dehydrated food from the Honest Kitchen into my rotational diet – so to find out even more you’ll just have to stop by my blog on Tuesday next week – as a bonus I’ve got some great products from the Honest Kitchen to giveaway too! 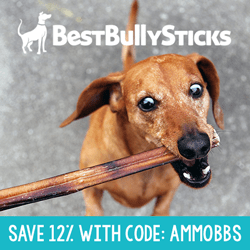 Grab a FREE SAMPLE BUNDLE + Coupon (A $10 Value) for $1 shipping with code AMBBGKD6100 from the Honest Kitchen! Don’t forget to check back next week for a fun giveaway with the Honest Kitchen! What is on your collar Ammo? Sorry to see your garden go..Next year? that’s a wonderful thing!! I won’t even let my guys go outside by themselves though. And I know you would never run away!!! I don’t run away, but I do like to wander when I’m hunting. It’s nice to have freedom, without making my mom worry where I am all the time. 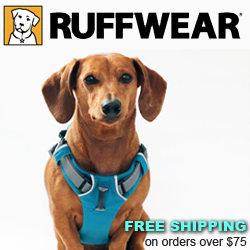 It’s great for dog beach trips & even hiking too! I see the value of them….just not really needed for my guys or you Mr. Ammo! You are a great inspiration..Keep up the good work!